Print Outlook emails in a customized way. Print Outlook E-mails the way you want! Solve your Outlook printing problems! Customize the printing of your Outlook mails with an easy to use interface. 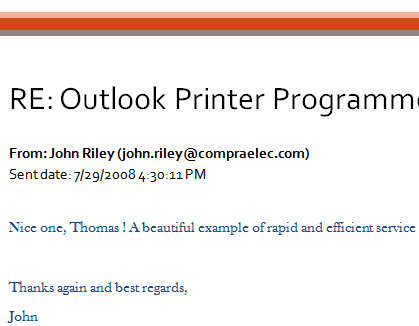 'OutlookPrinter' is an Outlook add-in to print your Outlook e-mails. Get rid of your Outlook email printing problems! 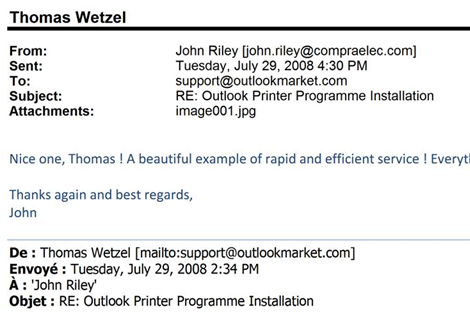 Did you ever want to print your e-mails in a different layout? Do you like that the mail account is printed at the top of your email print out? Do you think that it is acceptable that you cannot choose a different printer if you print your email in the Memo style? You are using your cooperate style in your normal documents. Why don't you print your email in your own style, too? 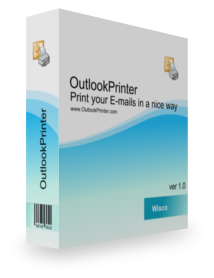 OutlookPrinter is the solution for your Outlook email print problems! Easy to use! When you want to print out an email you just click on the OutlookPrinter toolbar and choose 'Print selection with default template' and your email will be printed. Of course you can modify the look and feel of your template. You can customize the way you want to print out your Outlook e-mails. OutlookPrinter works in combination with Microsoft Word. If you want to print out an email then OutlookPrinter sends the email to your Word email template. Then the email is sent to your printer. Your attachments are completly supported. You can choose for every single template if you want to print a list of the attachments only or if the attachments should be printed after the email. A report will tell you what attachments were printed. You don't need to modify the format of the message any longer to get an overview over your attachments. You create or modify your E-mail templates with Microsoft Word with an easy to use interface. Customize your look of your emails easily. Save time and money with an easy to use interface. Use your corporate style in your emails, too. Filter by subject or sender address what emails should be printed automatically. "OutlookPrinter" runs on Windows 7, Windows Vista and Windows XP with Outlook 2000, Outlook 2002 (XP), Outlook 2003, Outlook 2007 and Outlook 2010 (32bit). 'OutlookPrinter' supports of course Exchange accounts, too. OutlookPrinter Version 2.0.0 is available for download.